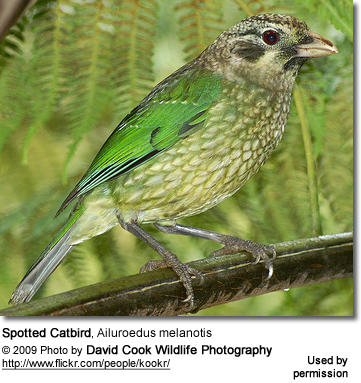 The name "Catbird" is applied to either unrelated or distantly related songbird families that have in common a voice that resembles a cat's meowing. 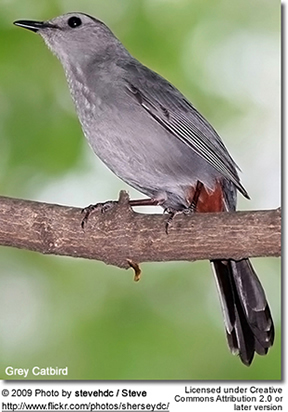 The plumages of catbirds vary from grey, blue-grey, greyish-brown to nearly blackish, possibly with dark / black markings. 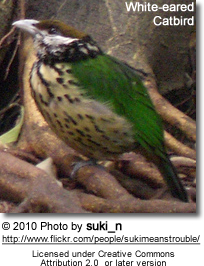 Their diet depends on the species -- with some species mostly eating insects (taken in flight) and some fruits. 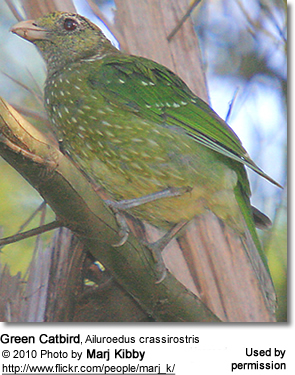 Other species mostly eat fruits and green food; while some take fruit, seeds, flowers, insects and even the eggs or chicks of other birds. 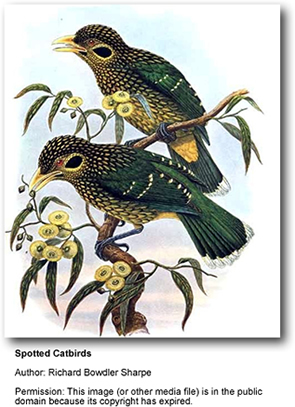 The nests are usually constructed out of twigs, grass, leaves, bark and roots; and lined with fine grass in bushes, vines and low trees often near creeks.